Owners of Wisconsin’s four largest wind energy projects will pay out approximately $2.8 million in rent to landowners hosting turbines and payments in lieu of taxes to local governments for 2010, according to figures compiled by RENEW Wisconsin, a statewide renewable energy advocacy organization. Wind energy developers negotiate lease agreements with landowners to host turbines on their property. Payments can be as high as $7,000 per turbine per year. Estimated rental payments to all Fond du Lac and Dodge county landowners will total slightly more than $1.2 million in 2010. 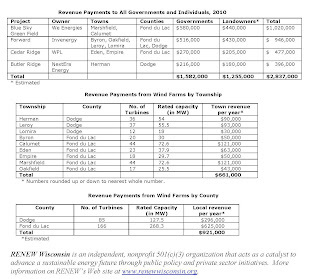 Towns and counties do not collect property taxes from wind turbines but instead receive payments based on the generating capacity of each turbine, allocated under a formula adopted by the Legislature in 2003. Payments to those local governments will reach almost $1.6 million for 2010. 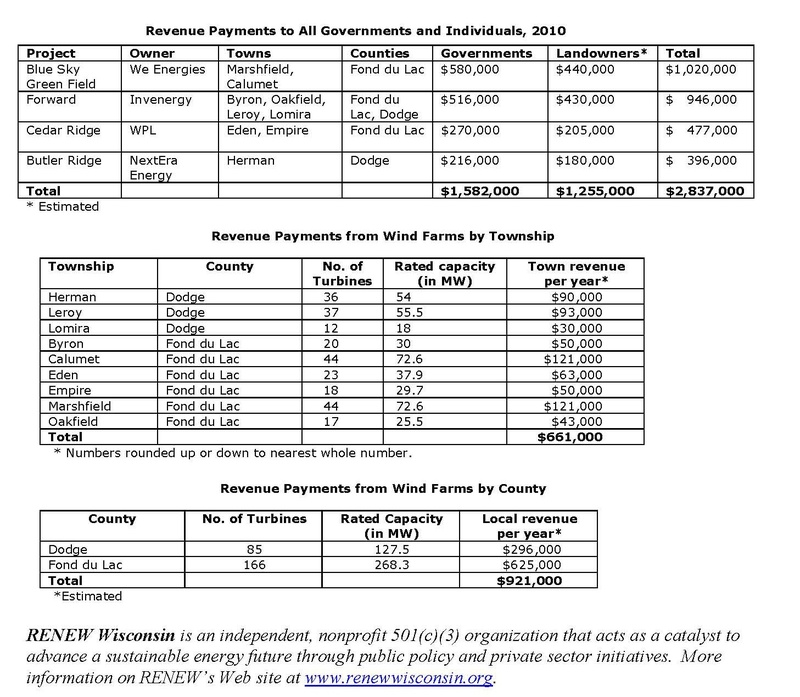 Four wind projects – Forward, Blue Sky Green Field, Cedar Ridge, and Butler Ridge – account for the payments to host landowners and local governments. Together these projects comprise nearly 90 percent of Wisconsin’s wind generation fleet. When calculated over a 20-year contract period, total revenues should exceed $60 million, taking inflation into account. Shirley Wind, the state’s newest wind power installation, will contributed another $80,000 a year, divided equally between Brown County, Town of Glenmore, local landowners, and neighbors within one-third of a mile of a turbine. The eight-turbine, 20-megawatt project began producing electricity in 2010.